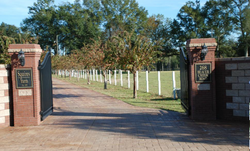 From the well lit brick and iron main gate to the brick paved road lined with lit trees, Squires' Farm is the perfect venue for your outdoor reception or event. As you can see in the pictures below, the land is wide and open for the layout and design of your dreams! We would love for you to make an appointment to come and take a look!